Fiction – paperback; Lilliput Press; 228 pages; 2017. A few years back I read Kevin Casey’s A State of Mind, a memorable novel about a struggling writer living in Co. Wicklow, whose life is under threat from the IRA. Loosely based on British author Frederick Forsyth’s experiences as a tax exile living in Ireland in the 1970s, it was part political thriller, part romance. I thoroughly enjoyed it but was disappointed to find that the rest of Casey’s work (three earlier novels from the 60s and 70s) was out of print. So imagine my delight to find that his debut novel, first published by Faber and Faber in 1968, sitting on the table in Hodges Figgis Bookshop on a recent trip to Dublin. Reprinted by Lilliput Press, The Sinners’ Bell comes with a short introduction by the author, who says his original intention was to write about the small Irish town in which he was born and raised to show how societal changes impacted the young people living there. What ensues is not only a credible portrait of a town undergoing change, it’s a melancholy portrait of a miserable marriage between a young woman and the local publican’s moody son. It’s incredibly atmospheric and captures the loneliness, despair and isolation of the new bride so perfectly I feel my heart aching with each turn of the page. From the book’s opening on the day of Helen and Frank’s wedding in a small town in Ireland, we know the marriage is not going to be a charmed one. It’s raining, Frank drinks too much, the piano is out of tune and played badly, and Keenan, the father of the groom, vomits at the reception. Later, safely arrived at their honeymoon destination — a seedy hotel in London’s Paddington — Helen hopes things will improve. They don’t. She had borrowed a travel book from the library and read of the Tower and the Palace and Madame Tussaud’s. London meant excitement to her. […] Frank had spent two years there but seldom spoke about them. Frank’s lack of talking about his time in London should be a warning to her: what is he trying to hide? But she’s just 20 years old and is rather naive. Raised by her father after the untimely death of her mother, she’s not exactly worldly-wise. She’s a good daughter, kind-hearted and optimistic about the future, but the first few days of her marriage are a major disappointment: there’s nary a word of romance or tenderness between the newlyweds (the wedding night itself is a shock to her), nor is there any chance to go sightseeing. Instead, Frank drags Helen to a succession of sordid pubs, so he can go drinking with his old mate, Tom. When the couple return to Ireland, living in a provincial backwater town, it’s not much better. They move into rooms above the pub that Frank’s parents own and where Helen does shifts behind the bar. It’s a lonely, joyless existence. Frank is volatile, manipulative, childish. His parents offer no support: his mother is cold and indifferent to Helen; his father is an alcoholic prone to grotesque displays of drunkenness, which often requires medical intervention. Her own father, with whom she has always had a close relationship, keeps his distance, not wanting to meddle in his daughter’s affairs now that she is married and no longer in his care. And strangely, she does not seek comfort from him, preferring to just get on with her lot, even if she’s desperately unhappy and doesn’t know where to turn. 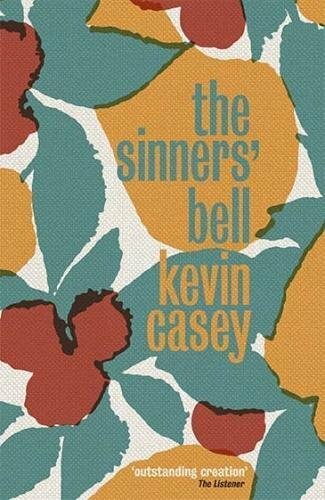 Largely told from Helen’s point of view, The Sinners’ Bell could be seen as a dreary, domestic novel, but Casey’s ability to get inside a woman’s head and to articulate her thoughts so well is a minor triumph. There is sadness, disappointment, betrayal and moroseness here, a dutiful daughter and wife whose passivity slowly gives way to a mounting anger and desire to take control of her own destiny — even if it’s too late. I read this book with a sense of dread. But I loved it’s beautifully evoked sense of claustrophobia, where everyone in a small town knows everyone else’s business, and where the Church controls every facet of a person’s life. It reminded me very much of John Broderick’s The Pilgrimage, which is also about small town life in 1960s Ireland, and Elizabeth Harrower’s Down in the City, which is a portrait of a dysfunctional marriage between polar opposites that is doomed to failure. The Sinners’ Bell isn’t a cheery read. But it’s bold and atmospheric, an unflinching examination of a way of life long since over. Thank goodness. I read this as part of Reading Ireland Month, which is hosted by Cathy at 746 Books and Niall at The Fluff is Raging. The sense of claustrophobia is implied by the realisation (in the reader’s mind) that there is no easy way out for Helen: she’s married a cad and can never divorce him and there’s no one fighting her corner. This sounds a tough read, but an excellent one. As you say, thank goodness it can be read as a period piece! Not tough at all… just claustrophobic as you realise there is no way out for Helen in a culture that forbids divorce. 1950s Australia was pretty dreary but I’m glad I didn’t grow up as so many Irish Catholics seem to have “where the Church controls every facet of a person’s life.” The C of E – and I was an altar boy – was relatively hands off. The Church controlled education too as well as health care and public morality, do there really was no escape. I’m not Catholic but am totally fascinated by the ways in which this religion had such a stranglehold on Irish life. Maybe they just got married so that they could hit the sack together! Like that poor girl in The Sea by John Banville. Oh yes, forgot about that one. Thanks. I hope you do get to read it. It’s one of those novels that stays with you long after you reach the final page.